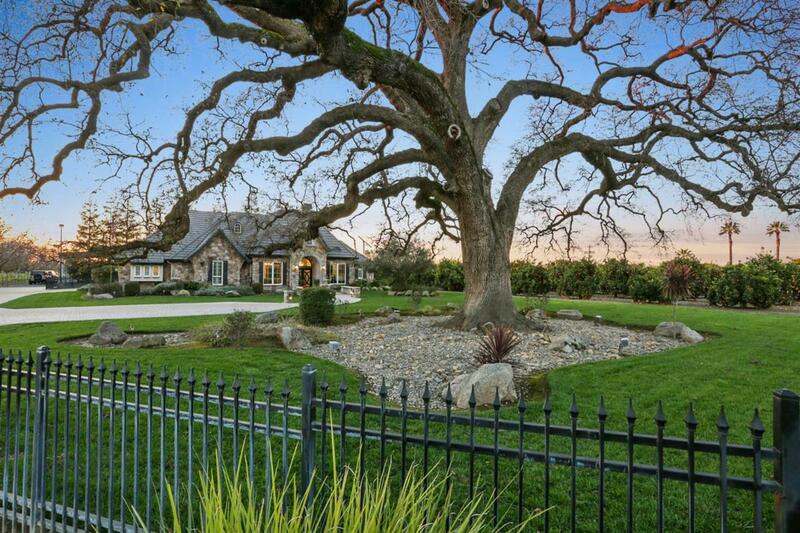 Upon entering this magnificent gated 7.5+acre estate you will be in awe of the stately oak tree that encompasses the entrance. Enter the courtyard and through the front doors you will find the lifestyle you've dreamed of. Formal and informal dining option and current home office. Living room with exposed vaulted wood ceilings seem to continue on infinitely as they carry out to the patio. Kitchen has been tastefully remodeled, with quartz counter tops, a farmhouse sink, neutral cabinets and boasting center island with Jenair cook top. Master bedroom with newly remodeled bathroom is luxury at its finest! Quartz counter tops at dual vanity, Rain waterfall shower head. Outdoor pavilion has fireplace, and is equipped with sound perfect for entertaining. Putting green, with beautiful water features. Shop with covered parking perfect for your motor home, room for all your toys. All this surrounded by your own established Orange grove. This home was featured twice in Lifestyle Magazine.